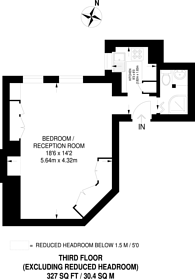 This fantastic studio flat is set within a prestigious Victorian building with a porter. The property is set on the fourth floor with far-reaching views and accessed via lift or stairs. Chelsea Embankment runs along the River Thames to the south of King's Road. For green space the idyllic Chelsea Physic Gardens and Burton's Court are close by, as well as leafy Battersea Park. Sloane Square is just a short walk away. 327 (30 Sq M) approx.